These are important messages to get out into the world, and my hope is that ‘For the Love of Me’ will motivate mothers and fathers and demonstrate to them that raising their little ones does not have to be difficult. Author JJ Campagna has released her gentle, motivating guide to raising young children with love and compassion that equips parents with the necessary tools to foster growth in and meet the crucial emotional needs of their little ones against the backdrop of today’s increasingly chaotic and technology-focused world. 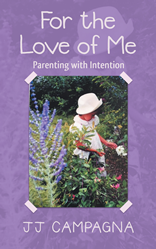 In “For the Love of Me: Parenting with Intention,” Campagna reminds parents that there is much to be learned from young people, empowers them to live as a strong example to their kids and provides them with the blueprint to preserve and encourage their children’s sense of wonder and imagination. A collection of bite-sized bits of wisdom delivered in the voice of a child, “For the Love of Me” is a small book with a large impact, and it’s messaging is universally applicable to anyone who touches the life of a child. Ultimately, Campagna’s book is focused on guiding parents to raise their children with intention, instill guidance and good values in their kids at an early age to better prepare them for adolescence and adulthood, serve as strong role models for their young ones and enjoy the magic of childhood and growing up. JJ Campagna attended Glassboro College, took many classes in early childhood education and drew much of the guidance presented in “For the Love of Me” from her experiences raising two children and six step-children and being a grandma to her 19 grandchildren. An avid writer, Campagna is currently working on a new series about caregiving, widowhood and reinventing herself and anticipates she will release the first book of the series in early 2019. She currently resides in Ocean City, N.J.